THE ONE Award looks to annually recognise an incredible hero – a person who wakes up every morning and puts others first, and dedicates his or her life to helping those in need. , A project by the Rotary International District 3450, THE ONE is dedicated to shining a light each year on one person that truly embodies the Rotary motto, “Service Above Self”, and supporting that person with funds to further their work. 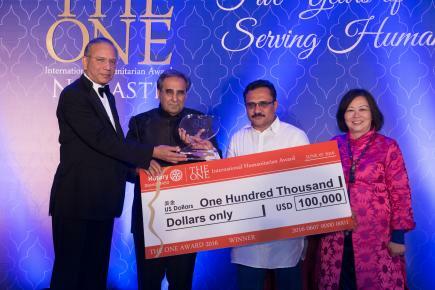 We caught up with Dr. David Harilela, an ardent businessman and devout humanitarian, to find out more about THE ONE Award that he conceptualised and founded. What inspired you to create THE ONE award? In 2011, prior to my becoming a Rotary District Governor, I asked myself as Governor what is it that I could I do to make the world a better place. The answer came to me when I heard of the inspirational works of Dr. Hendrik Wuebben, during one of our Rotary Clubs meetings. The story of his sacrifices and his will to serve others, even after being mugged by a patient that he had cured on the very afternoon of his mugging, moved me to no end. I then decided to combine his great works and that of my other favorite heroine, the late Mother Teresa, to create THE ONE - a humanitarian search for the unsung heroes of the world. Our role would be to find, reveal and further empower these individuals so that the world could truly benefit from their great works. Unfortunately even till today I have never had the opportunity to meet Dr. Wuebben face to face, and that remains on my have to do list. How does THE ONE award help the winner? We have been awarding 4 awardees every year by giving the winner US$100,000 and each of the other finalists US$50,000. We have also expanded our activities by launching THE ONE HK in 2015 to allow us to also award 3 more unsung heroes in Hong Kong every year, and thus recognise heroes from Hong Kong and the world. The award money they received will be used to further their humanitarian causes. We also have established an Emergency Fund for our past winners and finalists, to provide Emergency aid to our Finalists in case of any urgent humanitarian crisis emerges in their area. This year’s winner was Dr. Rajendra Dhamane, whose aims are to care for mentally ill and homeless people in Ahmednagar, India. What made him and his organization stand out from the rest? I am never involved in the final judging process as I want to be totally impartial when the winner is chosen. Every year we have five very distinctive and prominent judges on the judging panel and they are the ones who make the final decision and choose the winner. However, I did receive a comment this year that it was the hardest decision for the judges to make, and surprisingly it turned out all of them voted for the same finalist, who is now our winner – Dr. Rajendra Dhamane. I believe Dr. Dhamane must have obviously impressed the judges during the live interview thatwe conduct with all our Finalists. Aside from this, what have been some of your favourite past winners? It is impossible to choose a favorite as every one of them has their own special attributes. What never ceases to amaze me, about all the finalists and winners, is their great dedication to serving others constantly. Do you keep in contact with past winners? How successful have they been in using THE ONE award to meet their project aims? We do stay in touch with our past awardees, and from time to time we can see how our seed money has flourished into something bigger and more sustainable. For example, last year’s winner Mrs. Sindhutai Sapkal, also known as the mother of all orphans, used her Award money to expand her orphanage to include a vocational training centre for the orphans. Her original orphanages provide basic education but Sindhutai wanted to prepare them for the real working environment and help them be more competitive. The Award money enabled her to provide computer and English courses to the orphans. Other past awardees have built rehabilitation centre, schools and hostels, and provided ambulance service for child-birth deliveries. What are the biggest achievements and challenges that you have experienced during the running of THE ONE? Our biggest achievement is that we have made an impact globally and to date, over 250,000 lives have been saved or improved in the past 5 years, and over US$1.6 million has been donated to our 21 awardees from 13 different countries. The challenge was how to start a global search from tiny Hong Kong. I was bewildered at first, but I knew THE ONE was the right path for me. Every time I asked for time to speak and talk about THE ONE, at venues and programs locally and overseas where I was not slated to talk, I was allowed to do so. So I had the chance to inspire and motivate others, and I thank God for that opening – and for empowering me with the gift of tongue that comes whenever I start to talk about THE ONE! I was thus able to speak to different organisations both outside and inside Rotary, and secure their cooperation. In the near future, I am planning to expand THE ONE to other countries, just like how THE ONE HK is running now. Our vision is to ultimately set up a local award in each country so that we can maximise the influence of THE ONE and benefit more people in need. We will first expand in Asia then hopefully one day the world! You are the first to now learn that we will be launching THE ONE Philippines next! As an influential Hong Kong based philanthropist, do you think it’s more important to focus funding towards local or international humanitarian projects? I think they are equally important. Regardless of their levels of poverty or hardships, they are all people that need our help. Locally there might not be as severe a problem as a famine or drought, but the hardship that the low-income families in Hong Kong are going through should not be treated lightly just because their problems are not fatal. To each and every one of them, the fight against difficulties in daily lives is real. That’s why I believe they deserve equal attention. And last but not least, Hong Kong is my home, and my duty and goal remains to serve my community best.